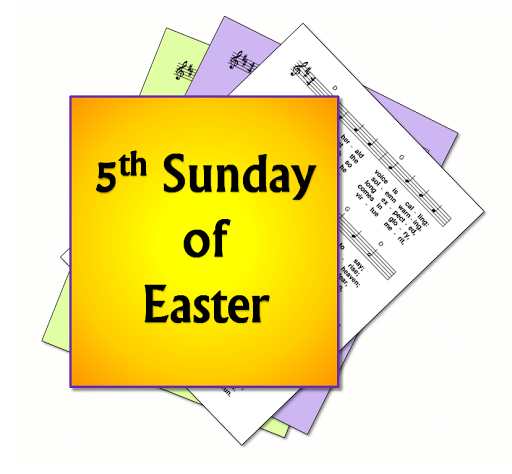 A selection of hymns and songs, based on themes from the Roman Catholic lectionary for the fifth Sunday of Easter, Year C.
A small number of particularly appropriate hymns that are still copyright may also be included. First: Acts - Paul and Barnabas continue their travels - in each church, the appointed elders and commended them to the Lord. Eventually they return to Antioch and give an account of their work. Psalm: 144 - I will bless your name forever, O God my King / The Lord is kind and full of compassion / All your creatures should thank you / Yours is an everlasting kingdom . Second: Apocalypse - John saw a new heaven and new earth - the new Jerusalem ... now I am making the whole of creation new. Gospel: John - I will give you a new commandment, love one another just as I have loved you. A new creation - Christ puts fresh heart into the disciples - Christ lives among us - all are made new.